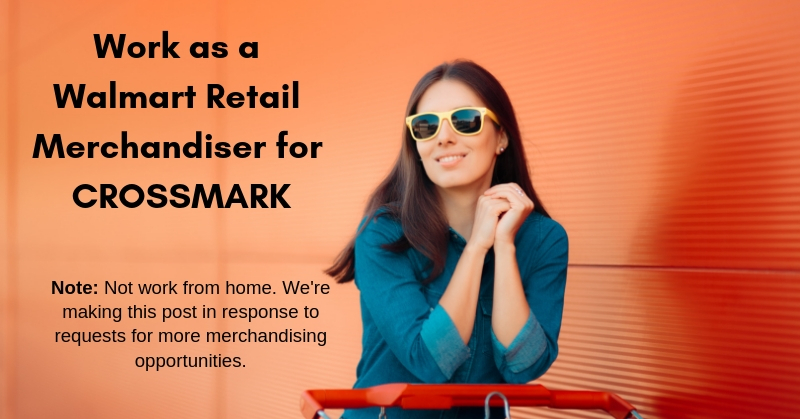 This is not an at-home position, but many of our visitors like the flexibility and autonomy that merchandiser jobs offer and they’ve asked us to post more of them. People who do this job rate it an average of 2.6 our of 5 stars on the Glassdoor site. Click here for full details and to apply. For more jobs like these, check our Newest Jobs & Gigs page. May you be working from home soon! This entry was posted in Hiring Companies, Jobs That Don't Require a College Degree, Part-Time Jobs and tagged CROSSMARK, Merchandisers, Walmart. Bookmark the permalink.